Medicago is a leading clinical-stage biopharmaceutical company using disruptive plant-based and virus-like particle (VLP) technologies to rapidly develop innovative vaccines and therapeutic proteins for infectious diseases and emerging public health challenges. Medicago’s technologies represent a game-changing approach to vaccine development and disease response. 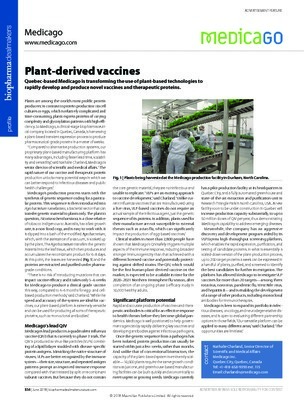 Unlike traditional pharmaceutical manufacturing, Medicago’s plant-based platform can more rapidly produce safe and effective vaccines and antibodies while also potentially providing broader and more sustained protection.